Over the last 25 years, obesity rates among children and youth in Canada have nearly tripled. As a parent, you are the most important influence on your teen's nutrition and will help her to maintain a healthy body weight. 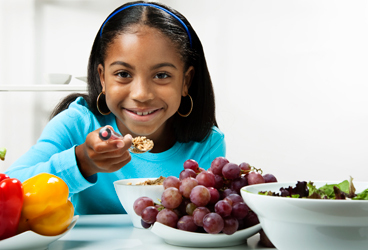 Be sure your teen is eating well, as good nutrition fuels your teen's growth and development. Many teens love energy drinks. They might feel that these drinks improve their performance in sports or workouts. The companies that manufacture these beverages also use powerful marketing tools aimed at young people. Often, energy drinks are marketed as part of an extreme sports lifestyle that many teens find captivating. It's important to know the difference between energy drinks, like Red Bull® , Monster®, or Rockstar®, and sports drinks, such as Gatorade® or Powerade®. Sports drinks were created for athletes who are engaged in strenuous activities. When we work hard and sweat, our bodies lose water, and we can become dehydrated. Sports drinks contain sodium to help replace what we lose through sweat and carbohydrates to provide energy for active muscles and the brain. Staying hydrated before, during and after activities is an important part of maintaining peak performance. For exercise lasting less than one hour, water is the best fluid choice. Energy drinks, on the other hand, usually contain caffeine and lots of sugar. In fact, one energy drink can have the equivalent of up to 14 teaspoons of sugar! Caffeine is a stimulant and can be found on energy drink labels listed as guarana, yerba mate, or caffeine. Most drinks have 80 mg per 250 mL can, though some have more. That is double the amount of caffeine in soft drinks. The amount of caffeine in most energy drinks exceeds recommendations for children. Health Canada suggests no more than 45 mg/day for children 4-6 years, 62.5 mg/day for 7-9 years and 85 mg/day for children 10-12 years. Caffeine can cause nervousness, anxiety, jitteriness, stomach/intestinal upset, rapid heart rate and trouble sleeping in some individuals. In addition, a high caffeine intake can also result in withdrawal symptoms such as headache, fatigue, irritability and poor concentration among those who consume it regularly. Read the label carefully for the caffeine and sugar content. No one needs an energy drink and they are not recommended for children or pregnant or breastfeeding women. Energy drinks should not be consumed with alcohol, used during exercise or consumed in amounts more than 500 ml a day. Energy drinks might make you feel a short burst of energy, but it doesn't last. The best way to get energized is to eat well, be active, stay hydrated and get enough sleep. Water, milk and soy beverages are great choices to keep hydrated at anytime. Eating your way to good health. Food Safety -Learn safety tips for all food types. Also, find information to protect those who are vulnerable to food poisoning, including facts on food allergies and recalls. How to eat your way to a successful school year. This handbook is designed to help school communities develop nutrition policies and implement changes to promote healthier eating options.